It’s time to monkey around, jumping from tree to tree trying to escape the jungle, where everything is out to get you! From snappy crocodiles to hungry piranhas you’ll never escape the wildlife! Welcome to the world of Monkey Ropes! Brought to you by the creators of Icy Ropes, Bouncy Bits & Fishy Bits! Collect coins, open up secret jungly boxes, and unlock a super awesome collection of characters! 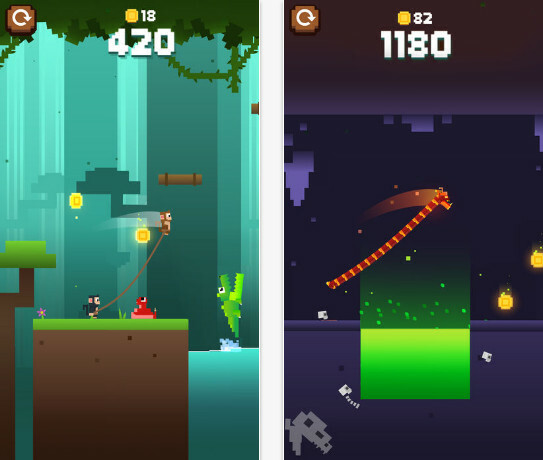 – Lots of enemies and obstacles to dodge and traverse! – Explore the Jungle, Treetops, Lava Pits, and Mystery Caves! – Don’t pull your buddy over the edge! Monkey Ropes is completely free to play. However, some items can be purchased for real money. If you don’t want to use this feature, please disable in-app purchases in your devices settings. Monkey Ropes was developed by PlaySide, the developers behind Editors’ Choice title “Catch The Ark”, Icy Ropes, Lego Batman, Batman v Superman, Spongebob : Sponge on the Run and Bouncy Bits..